Rinse and clean the chicken wings. Pat dry with paper towels. Set aside in a big bowl. Preheat oven to 425 F. Add the oregano, rosemary, cumin and salt to the chicken wings. Toss to combine well so each chicken wing is nicely coated with the spices. Transfer the chicken wings on a baking sheet and bake for about 25 to 30 minutes, or until the chicken wings turn to a nice brown color. In the meantime, mix the olive oil, basil, garlic, parmesan cheese and seasoning salt together in a small bowl. Maamoul, a shortbread cookie stuffed with date paste or chopped walnuts or pistachios and dusted with powdered sugar, is the perfect reward after a month of fasting during Ramadan and Lent. These cookies are waiting to be baked. 2- In a medium bowl, combine flour and semolina. Set aside. 3- In a smaller bowl, beat together butter for 30-45 seconds. Slowly add in flour mixture until combined. Stir in milk, allspice, and orange blossom water. Roll dough into 12 pieces. 4- In a small bowl, combine nuts and sugar. Set aside. 5- Grab your dough and push 2 inch circles into it, then place onto parchment lined cookie sheet. Place about 1 teaspoon of nut mixture on top of dough. Fold and press dough together to seal the filling. Repeat with remaining dough and nut mixture. 6- Bake maamoul for 20-25 minutes until golden brown. Soak skewers if using wood. Place shrimp in a bowl or ziplock bag. Blend marinade ingredients together in a blender until smooth. Pour marinade over shrimp and marinate 30 minutes or overnight. Prep pineapple. Drain the marinade from the bag or bowl into a small sauce pan. Skewer shrimp and pineapple, alternating on skewers ( Skewer pineapple the flat way so shrimp and pineapple are about the same wide, and both lay flat on the grill. That way you will have good grill marks on both. This should make 10-12 x 10 inch skewers. Lay the skewers down, grilling each side about 3 minutes, or until good grill marks develop, and shrimp is cooked, but not overcooked. Place on a serving platter. Drizzle with reduced marinade or lime. Remove on of the outer leaves of the cabbage and keep, in tact. Thinly slice the rest of the cabbage and combine with the salt in a large bowl. Using your hands, massage the cabbage and the salt together until the cabbage has softened and released a substantial amount of liquid. This should take 5-10 minutes. Transfer the cabbage and all of the juice to your clean jar. Pack the cabbage down so that the level of the juice is higher than the level of the cabbage. Use your in-tact cabbage leaf as a cap over the shreds — tuck it down to hold everything in place underneath the juice. Close the jar and let it sit at room temperature for 3+ days. 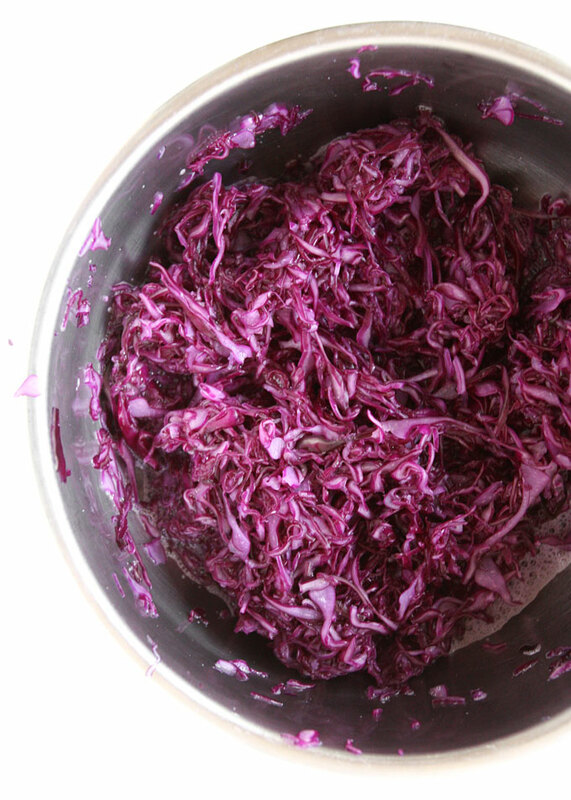 Every day, use a wooden spoon to press the cabbage down and release any trapped gas bubbles. After 3 days (less, if it’s in a really hot environment), taste it! 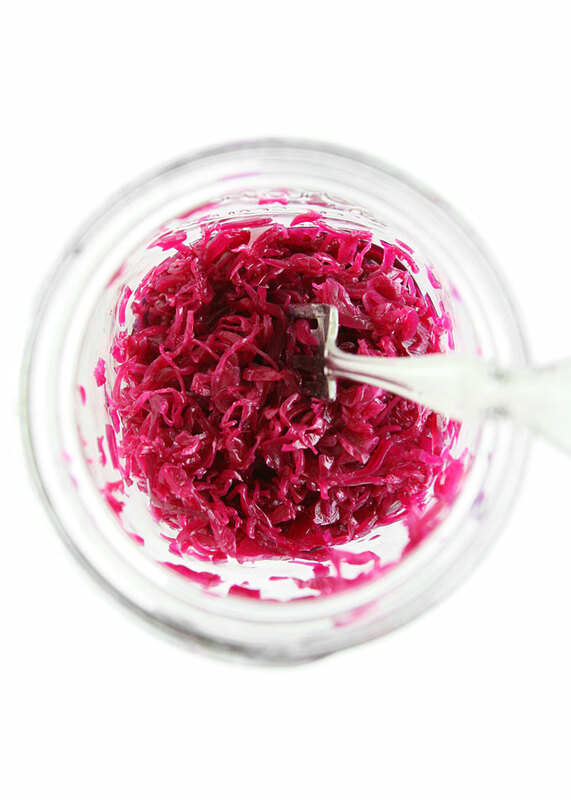 You can either put it in the fridge, if it tastes “done” to you, or let it keep fermenting. When it tastes how you want it, put it in the fridge and store there in an airtight container. Place maple syrup and water in a small pot. Add ginger and whole spices. Heat over medium heat and simmer for 5-10 minutes on low heat. Let stand 10 minutes. The longer you infuse, the more intense the flavor. You could let this sit overnight, or strain it right away.